Trigger Warning: The following article contains discussion of harmful psychological conditions, and includes a brief reference to eating disorders. While the last Supernatural was primarily a Monster of the Week and fairly unremarkable in a history of similarly formatted stories, the final three minutes of the episode have sparked debate and discussion within the Supernatural Family regarding a repeated theme that has divided the fans for years: the codependency of the Winchester brothers. Codependency is signified by, essentially, making a relationship more important to you than you are to yourself. Within the Supernatural fandom, it’s a heated point of contention: for some fans, it’s a rallying point, a symbol of the fact that the Winchesters are willing to die for each other. For others, it is a repetitive story device that has become a tiresome trope, used to manufacture drama between Winchesters and the rest of the Supernatural world. 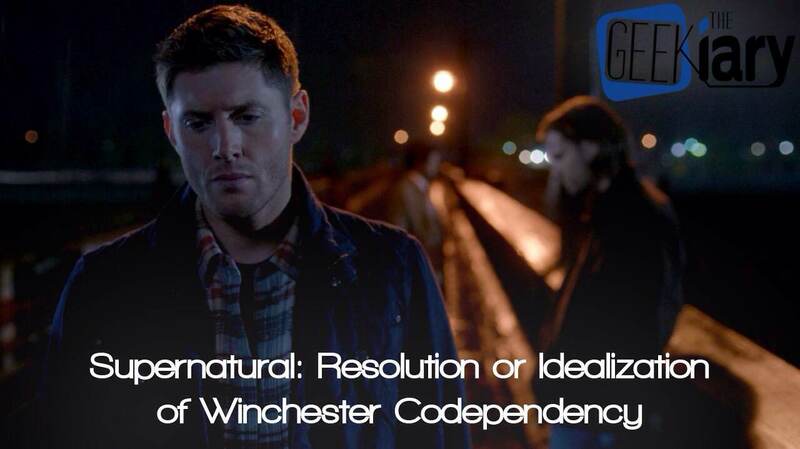 Regardless of personal stance on the matter, Sam and Dean Winchester are undeniably codependent, following many of the denial, low self-esteem, compliance, control, and avoidance patterns outlined as characteristics of codependency. Posted on February 11, 2014, in Articles, Commentary/Reviews and tagged Dean Winchester, Sam Winchester, Supernatural. Bookmark the permalink. Leave a comment.